In a customised Perspex case in Sotheby’s Book Room sits a pinkish-red square of paper, clipped at the corners and no bigger than a bottle top. Shine a light through it and you can make out the vague trace of basic design. To the uninformed eye, it would seem improbable that it might be worth even a fraction of the $10–20 million it is expected to fetch when it is sold at auction at Sotheby’s New York on 17 June. This is the British Guiana One-Cent Magenta, a postage stamp that has already broken three records at auction since it was printed in 1856. It is the world’s rarest stamp – by weight, the Sotheby’s valuation makes it the most expensive object on earth. The obvious question is: why? Apollo has covered stories on other similarly small but extremely valuable objects over the last few months. But what can a faded strip of paper offer to command a similar estimate to a Ming dynasty ‘chicken cup’ or a ‘lost’ Fabergé Egg? The price tag is in part attributable to scarcity – it’s the only known example of its issue known to exist, and after a laborious authentication process, there is no doubt that it is indeed the real deal. There’s also the matter of the stamp’s provenance; the story of its 158-year journey from sugar-cropping colony to the showroom of a London auction house is nothing if not remarkable. In the 19th century, Britain would regularly ship out supplies of stamps to its Empire. In 1856 one such shipment to British Guiana failed to arrive. In desperation, the colonial postmaster turned to a local newspaper publisher and asked him to print out two issues of temporary stamps, valued at 4 cents and 1 cent and adorned with the colony’s motto: Damus Petimus Que Vicissum – ‘we give and expect in return’. The stamps were in circulation for only a brief period before a new consignment arrived from Britain. Around 20 years later, a Scottish schoolboy whose family had emigrated to the colony discovered the stamp on an old envelope, and sold it on to N.R. McKinnon, a low-level collector. McKinnon didn’t quite know what he’d stumbled across, but he knew it was something exceptional. He sent it to Glasgow for inspection, where his hunch was confirmed: this stamp was indeed unique. The stamp ended up in the hands of Philipp de la Rénotière von Ferrary, at the time the world’s most famous philatelist. On his death, his vast collection – said to have been the largest ever to have existed – was installed intact in Berlin’s Postmuseum. After the First World War, Germany handed it over to the French Government as a reparations payment. 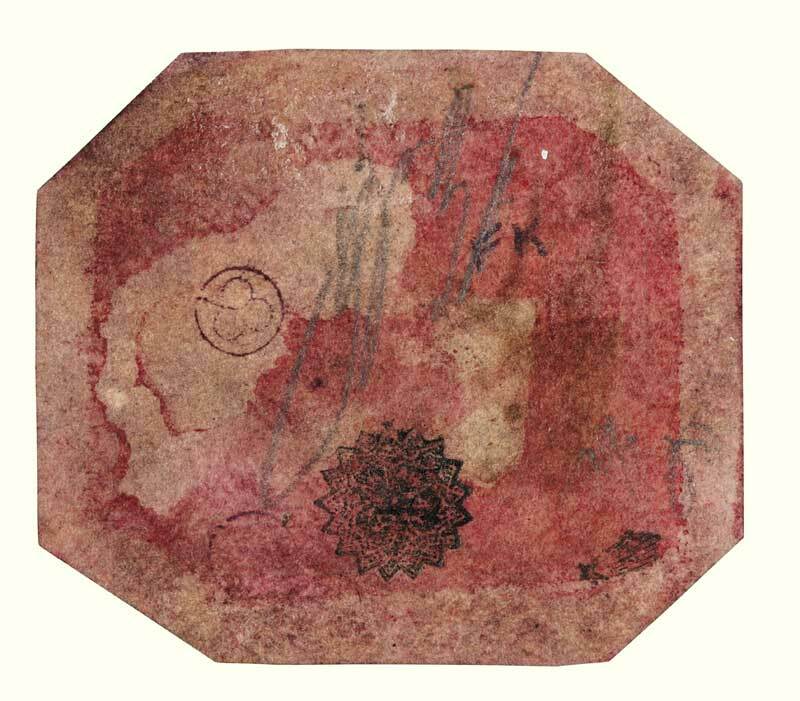 The collection was split up and sold at auction, where the British Guiana Magenta sold for a historic $35,000. The stamp did the rounds of major private collections across America before finally winding up in the hands of the scientist, philanthropist and sportsman John E. Du Pont. Du Pont, who established the Delaware Museum of Natural History and was largely responsible for the popularity of pro-wrestling in America, was an eccentric, brilliant but unquestionably troubled character. When he died in 2010, he was serving a prison sentence for the murder of Olympic wrestling champion Dave Schultz. The sale of the British Guiana Magenta is part of the ongoing auction of his assets. When it was sold to Du Pont in 1980, it went for just short of a million dollars – almost four times the sum of its previous sale 10 years before. To put the top end of Sotheby’s estimate into context, it’s worth comparing it to two other recent sales by the auction house’s Special Projects department; it is considerably more than the $14 million reaped by the sale of America’s first printed book last year and just shy of what one collector paid for a copy of the Magna Carta in 2007. Can rarity alone put a scrap of paper into the same league of value as these cultural touchstones? DuPont had nothing to do with professional wrestling, the pseudo-sport popular in America as television entertainment. He was a supporter of amateur wrestling, the Olympic sport, pursued most often in the U.S. On the high school and college level. High-level international competitors can make a living at it, usually subsidised by national federations, but it’s not what we call professional wrestling in the U.S.